From left to right are: Jim Hill of Cannon County Food Bank, Yvonne Grimes of Cannon County Food Bank, Jim Adcock of Reed Realty, Phyllis Robinson of Parsley & Todd Realty & Auction, Reba Denny of Cannon County Food Bank, and Bill Parsley III of Parsley & Todd Realty & Auction. The Middle Tennessee Association of REALTORS® made a donation to the Cannon County Food Bank in Woodbury Wednesday as part of their “From Our Home To Yours” Food Drive Program. REALTORS® from Cannon County collected canned goods and other non-perishable food items for the drive, which can be distributed to hungry families in our area. This contribution is part of a larger initiative by MTAR, which held similar food drives in 4 other counties across Middle Tennessee. “It was important to us that the food we raised within our communities stay in our communities,” explained MTAR 2010 President-Elect Janet Nettles of Coffee County Realty & Auction in Manchester. 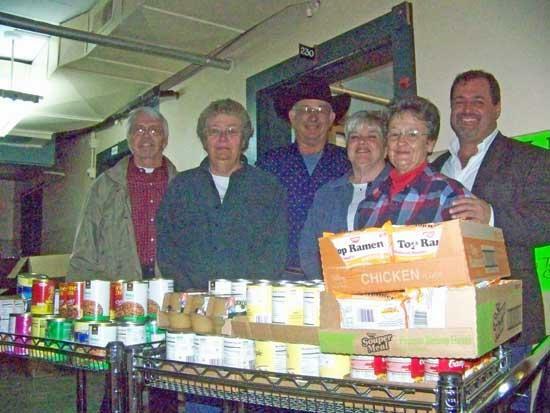 “We wanted to make sure that our friends and neighbors were the ones to benefit from our food drive, which is why are proud to call this project ‘From Our Home To Yours.’ This was our second year hosting such a Food Drive, and we’re thrilled to already see an increased response and participation over last year!” Within Bedford County, MTAR members from Parsley & Todd Realty & Auction and Reed Realty contributed to deliver bundles of food to the Food Bank. “REALTORS® have a responsibility to improve and contribute to the communities in which we live and work,” noted MTAR 2010 Public Relations Chairman Marty Holder of Exit Realty Bob Lamb & Associates in Murfreesboro. The Middle Tennessee Association of REALTORS® is a not-for-profit trade association serving over 1,500 real estate professionals across the Middle Tennessee region. The mission of MTAR is to provide its members with state of the art tools, training and support to ensure that all members have the ability to become ethical, professional and successful REALTORS®. MTAR engages in several community service and charity projects each year, including the 4th Grade Foresters project, National Make-A-Difference Day, Toys for Tots, and multiple charity golf tournaments to raise money for college scholarships, diabetes research, and the Coffee County Readers of Tomorrow program. For more information, visit www.mtar.org or call toll-free 877-893-2242.